My wife knows the way to my heart. This past Valentine’s Day my wife Carly bought me a bottle of 14 year old George Dickel Tennessee Whisky. It is a hand-selected barrel from Dorignac’s, a local New Orleans-area grocery store. 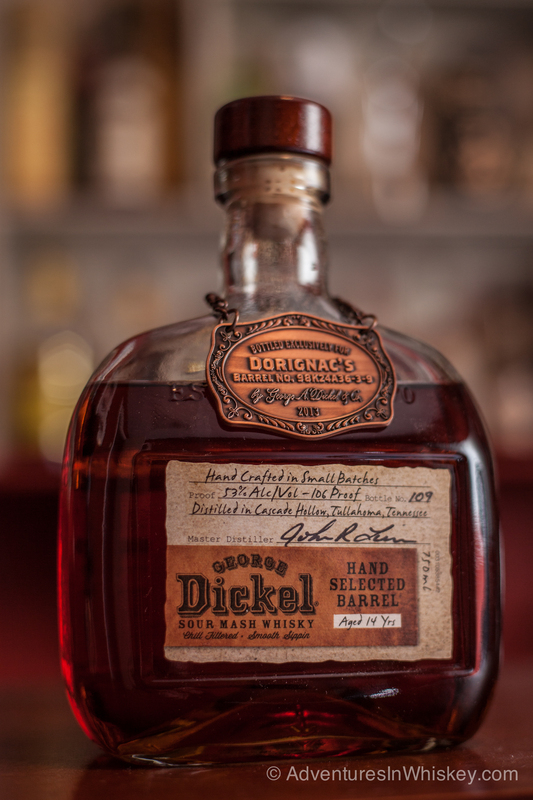 I really enjoyed the 9 year old George Dickel I received as part of the Dickel Dozen blogger program, so my expectations for the 14 year old Dickel were pretty high. On the nose I get lots of oak, light caramel, and vanilla. There’s a little baking spice in there… cloves or nutmeg, maybe? I love that the distillery kept this at 106 proof. You get some of that high-proof liveliness on entry, but calms down a little with more caramel, oak, and vanilla. It’s not as sweet as its younger brother. The finish is long and semi-sweet. Overall this whiskey is an oakier version of its 9 year old brethren. It’s not over-oaked. Instead it just turns up that flavor element. I tend to prefer older, oakier whiskies. A bottle of 14 year old George Dickel cost my wife about $70. The 9 year old will cost about $45. The big question is which of the two do I like best? For “everyday” drinking, I’d most likely reach for the Dickel 9 year old. For nicer occasions, I’d easily grab the 14 year old Dickel. Honestly, you can’t go wrong either way. Highly recommended. This sounds like a quality bourbon, I’d love to try it. Another canidate for the list!